"From April 4th to the 7th, Dian van de Laak-Kuipers, Sydney Brotheridge and I attended the International Conference on Comparative Cognition (CO3) in Melbourne Beach, Florida. This was APOPO’s debut at CO3, but we were well represented with three researchers. CO3 broadly covers all topics related to animal cognition. The 25th annual conference included symposium presentations, a master lecture, poster sessions, and a meet the editors (of peer-reviewed scientific journals) roundtable Q & A session. Dian van de Laak-Kuipers presented a poster entitled, Ratting on illegal trade: Using African giant pouched rats (Cricetomys ansorgei) to detect contraband wildlife products, which detailed preliminary results from APOPO’s ongoing partnership with The Endangered Wildlife Trust (EWT) from South Africa to examine the abilities of our African giant pouched rats to detect illegally trafficked pangolins and African hardwoods (funding provided by the US Fish and Wildlife Services and the UK Illegal Wildlife Trade Challenge Fund). A number of scientists attended the poster session and showed great interest in the project. Dr. Marcia Spetch, the 2018 recipient of the Comparative Cognition Society Research award, and Dr. Anna Wilkinson, a professor specialized in animal cognition, were interested in the rats’ potential application. I presented the poster, Broadening the life-saving repertoire of African giant pouched rats: Rapid re-training and maintenance of multiple odor discrimination. This poster described one project we’ve completed with the generous support from the Philanthropic Firmenich Family Foundation. I also gave a talk titled, Olfactory discrimination with a humanitarian purpose: African giant pouched rats as detectors of landmines and tuberculosis, which provided an overview of APOPO’s work and presented preliminary findings from our TB detection research that, when applied, may bolster APOPO’s overall impact. 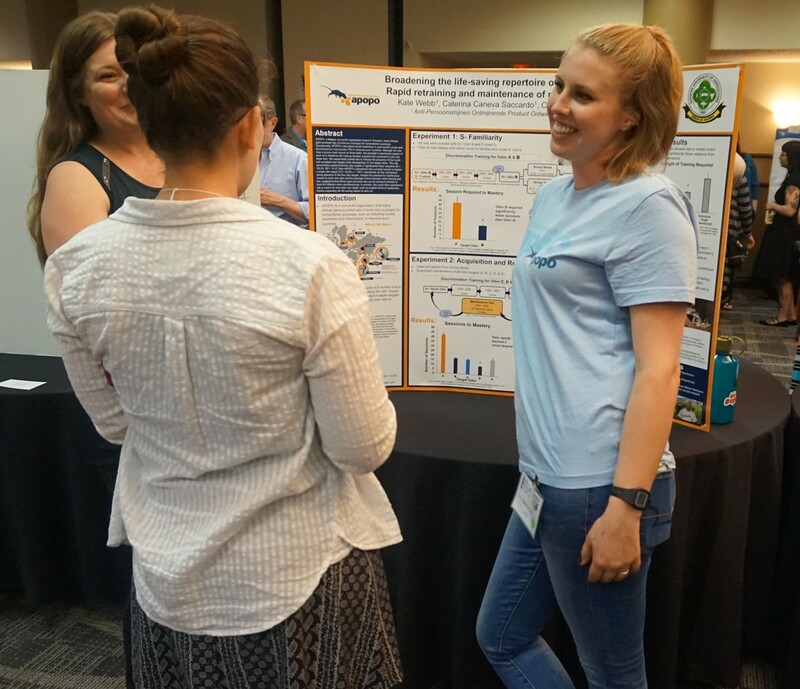 Sydney Brotheridge presented a poster that gave more information on how Discrimination training and odorant concentration influence scent detection performance of Cricetomys ansorgei, another project supported by the Philanthropic Firmenich Family Foundation. Sydney explained her experiment to many highly-regarded psychologists, including Dr. Cindy Fast’s (APOPO’s Head of Training and Behavioral Research & Development sector) former mentor from UCLA, Dr. Aaron Blaisdell. Our sessions were visited by all levels of researchers and the posters, along with my talk, prompted discussions about our custom semi-automated line cage, newly constructed operant chamber, and training procedures. We received tremendous support and feedback from the scientific community at CO3 including invitations to collaborate from faculty members at prestigious institutes, inquires from researchers interested in future job opportunities, and quality questions about the projects we presented on. We look forward to attending CO3 again in the future!"